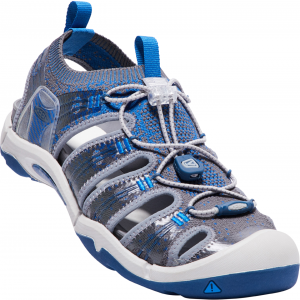 Inspired by the desire to challenge conventional construction and long-standing production techniques, the launch of KEEN’s visually disruptive UNEEK sandal in 2014 took the footwear industry by storm. Built around the sophisticated simplicity of two cords and a sole, this vagabond swiftly became coveted, adopted and loved by fans across the globe, who were drawn to its distinctive styling and the unique benefits of open-air footwear, with its characteristic lightweight feel and flexible and comfortable fit. Continuing the progression and extension of this contemporary line, for Spring/Summer 2018, KEEN proudly unveil the UNEEK EXO shoe. Joining the growing UNEEK franchise which also includes the UNEEK 02, Original and new HT models, the UNEEK EXO Illustrates the innovation and natural transformation of the UNEEK footwear family, featuring an evolution of design that traverses with ease between urban and outdoor jungles with a one of a kind look and incredible fit. With a weightless construction and athletic silhouette, the new UNEEK EXO builds off the original UNEEK sandal design, incorporating free-moving cords that form to the shape of your foot. Featuring a secure fit lace-capture system and an engineered mesh upper with strategic ventilation zones for unsurpassed breathability, the UNEEK EXO shoe delivers a glove-like fit and superb performance for summer. Built to deliver even in inclement conditions, mesh uppers feature a PFC-free durable water repellent, whilst a Cleansport NXT ™ treatment wicks away nasty whiffs and keeps feet smelling sweet for the long haul. Thermoplastic polyurethane (TPU) overlays add durability and protection in key abrasion areas, whilst an anatomical, PU footbed gives incredible underfoot comfort and support. 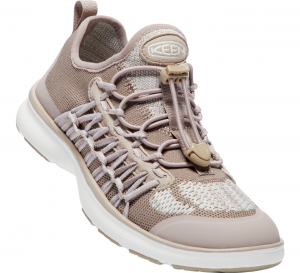 A lightweight EVA midsole delivers great cushioning and rebound with every step, whilst adopting the same athletic outsole utilised on KEENs popular UNEEK 02 model, featuring high-traction pods, for robust grip and durability. The Terradora Collection, introduced by KEEN in early 2017, created a wave of momentum with a unique style and performance that ignited a movement that KEEN calls TrailFit: turning any trail, mountain or city into an opportunity to get outside and get fit. Featuring a streamlined silhouette, on trend styling and a daring colour palette, the Terradora range combines a passion for working out in the great outdoors with a sense of everyday adventure that has resonated with KEEN’s female fans across the globe. For spring/summer 2018 this important collection grows with, KEEN debuting the open-air Terradora Ethos – a water adaptable, warm climate shoe – providing the perfect addition to complete this comprehensive collection, ensuring you can live and breathe TrailFit all summer long. Boasting the same blueprint of flawless fit and superb support found throughout the entire Terradora line, the Terradora Ethos features an open-air design delivering incredible breathability and comfort that is ideal for warm-weather work outs and summer outdoor fitness. Whether you’re working out at the waters’ edge, or happen to stumble across a stream when training off grid, the Terradora Ethos offers an unmatched versatility ideal for summer adventure on any trail. A PFC-free, durable water repellant upper features synthetic leather overlays for structure and protection, whilst a quick dry lining with Cleansport NXT ™ treatment ensures feet smell sweet and feel fresh and dry even on the warmest of days. Meticulously constructed in response to the individual biomechanics of the female foot, the Terradora Ethos features a reduced instep volume with a contoured last that is narrower through the heel, for a secure fit and superb stability on uneven or undulating terrains. A dual density PU footbed and low-density EVA midsole with ESS shank enhances overall comfort, protection and cushioning, whilst a KEEN All-Terrain Rubber Outsole with 4mm multi-directional lugs ensures all terrain versatility and traction, wherever your TrailFit journey may take you this season. 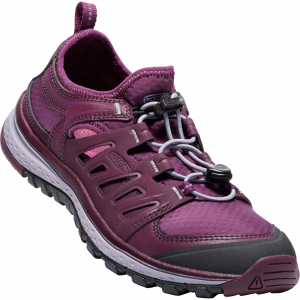 Featuring a secure-fit lace capture system for a quick and glove-like fit, the Terradora Ethos has been designed to promote a natural range of motion, promising a cushioned, responsive ride and fantastically flexible performance during all your summer adventures. Building on KEEN’s characteristic innovative and pioneering spirit, for SS18 KEEN present the EVOFIT ONE, a dynamic sandal debuting new engineering and construction technologies, that represent a huge leap forward in the open air performance, comfort, and style that have become synonymous with the leading brand. With versatility that is built to perform during adventures in remote destinations or simply when cruising around urban landscapes, the KEEN EVOFIT ONE excels in any environment, delivering incredible comfort and outstanding flexibility with an athletic silhouette and progressive styling. Created in the KEEN Innovation Lab in Portland, Oregon and tested throughout the world, the EVOFIT ONE is the first model to debut KEEN’s new EVOFIT construction system, a minimal-waste, fabric design that is engineered to move seamlessly with the natural contours of the foot in motion. Quick-drying and super breathable, with incredible ventilation for outdoor summer activities, KEEN’s new EVOFIT upper delivers a sock-like fit that feels like a second skin, ensuring outstanding out of the box comfort. Designed for enhanced performance in and around the waters edge, the KEEN EVOFIT ONE also features a PFC-free Durable Water Repellent (DWR) finish, with TPU overlays providing added structure and durability in key abrasion areas. A chemical free Cleansport NXT™ lining gives natural odour control, keeping feet smelling sweet and feeling fresh in all conditions. Debuting an evolved KEEN performance lace capture system, a custom, secure fit around the midfoot is assured, with balanced tension for added comfort and control on the move. A removable anatomical footbed gives superb arch support and underfoot comfort, whilst a PU midsole delivers long-lasting protection and exceptional cushioning. 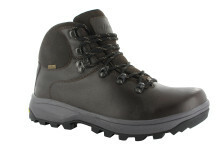 KEEN’s highly acclaimed Aquagrip rubber outsole with multi-directional lugs and razor siping ensures optimum traction whether trekking jungle trails or traversing rocky rivers.